People often ask us how Studio KotoKoto decide on which potters to work with, and the first thing that springs to mind is that we work with makers who create vessels that inspire use. It also doesn’t hurt if they share the same attractive names as us. So when I saw Watanabe Ai’s blue-and-white pottery, I immediately imagined all kinds of appetizers and snacks served on her lovely plates on top of my dining table. Simple everyday objects like onions, gourds, and flowers inspire Watanabe-san, who was educated as a designer at University of Tsukuba’s School of Art and Design. 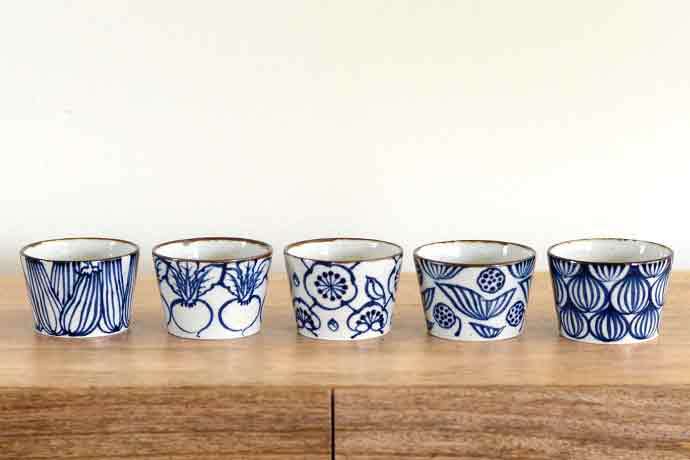 Blue-and-White cups by Japanese potter Watanabe Ai. She gets inspiration from simple everyday objects. She is quick to emphasize, though, that the most important element in making is to balance design with usability. “Pursuing the look makes pots too expensive or uncomfortable for use”, she believes, and “an effusive work is remarkably difficult to be accommodated into people’s lives.” Her creations are true to this philosophy, and bold as the patterns may seem, they enhance and do not get in the way of the food they carry. Balancing design with usability is of utmost importance to Watanabe Ai. 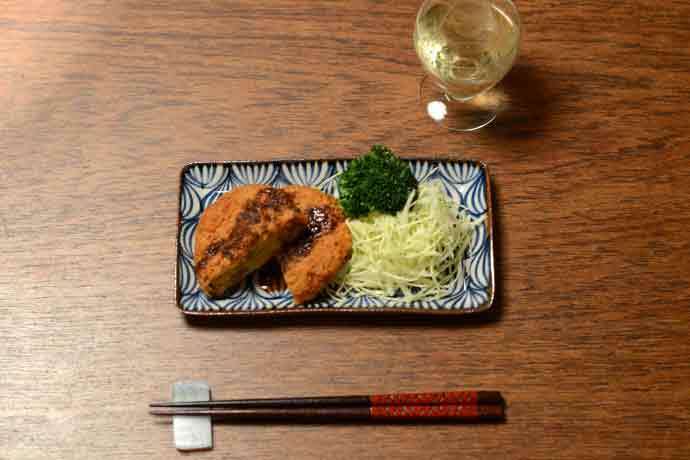 The bold design does not get in the way of food but becomes an enhancing background. “The brilliance of colors that I saw when I traveled in Asia, Turkey and England as a student really stuck with me, and I feel that it is coming out in my work,” Watanabe-san says. Certainly, the use of a single vivid shade of blue gives her work a distinct modern look, since the vast majority of Japanese blue-and-white pottery makers employ different shades of blue that gives them a more traditional look. Watanabe Ai painting onions on a cup. The use of a single vivid shade of blue gives her work a distinct modern look. After graduating from university, Watanabe-san initially worked for a toy trading company where she honed her skills in design through creating catalogs and 2D advertising. “I worked to sell things but I aspired to create things with my own hands,” she reflected. While visiting craft shows, she was motivated to become a potter because pottery-making seemed to allow for so much freedom in colors and shapes. So she left her stable job and went to study pottery at Seto Pottery Senior High School in Aichi prefecture. 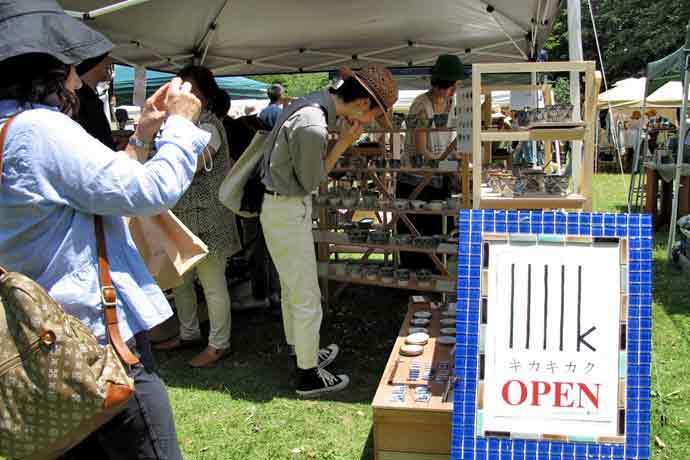 Watanabe Ai of Kikakikaku showing her work at a 2015 craft show in Japan. She was inspired to become a potter while visiting craft shows. When I met Watanabe-san in the spring of 2015, it had only been a year since she established a pottery business called Kikakikaku with her husband Murayama Takumi, who provides sales and production support. I remember being amazed that she was showing her work at a juried craft show alongside experienced and well-known makers. Just last month, Kikakikaku moved into an old house that used to be a hair salon and is currently in the process of being converted into a studio. Their plan is to have a mini-gallery adjacent to the studio, just like many potters do in Japan. “That’s our dream, and for us to make a living by making pottery”, Watanabe-san says. 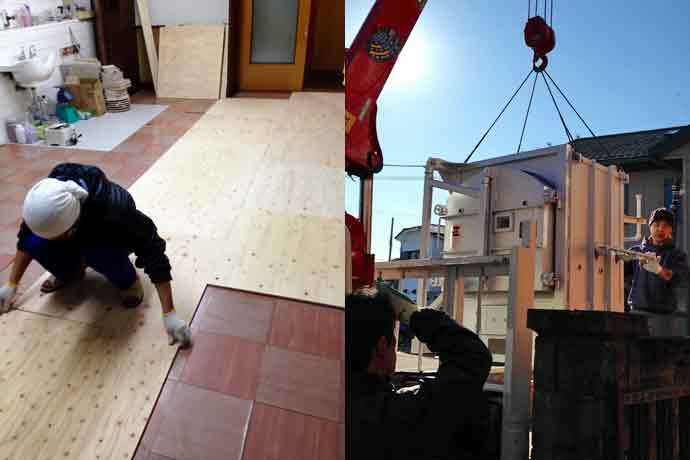 The new pottery studio and kiln of Kikakikaku in Odawara city in Kanagawa prefecture. In the photo, Murayama-san is converting what used to be an old hair salon into the pottery studio. She is eager to gain more experience and develop more techniques to create wares as close to what she has visualized while she is making them. “Pots warp and shrink, and the colors of the stain and texture of the glaze turn out differently depending on the temperature and density of the kiln”, Watanabe-san explains. 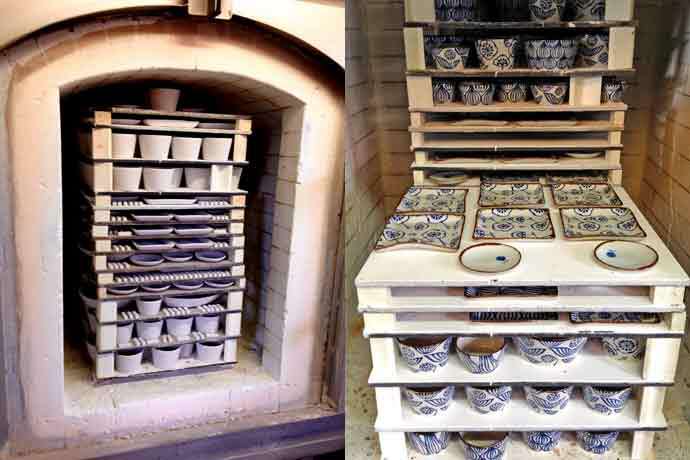 Photos of pots before and after firing in a kiln. 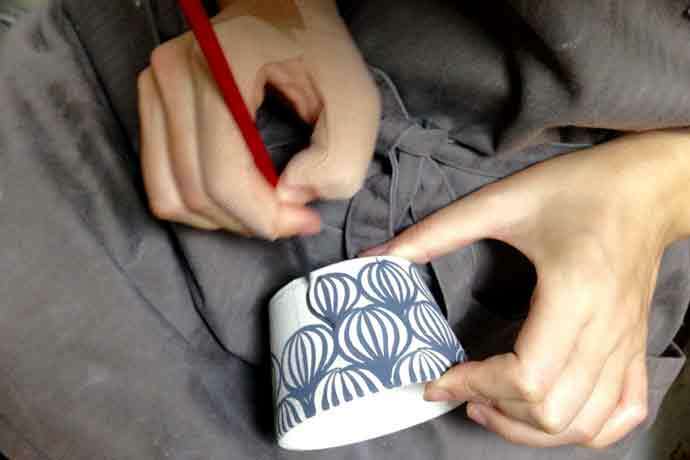 Watanabe-san is eager to build up her experiences and techniques so that her completed pots have the desired colors and consistency of glaze. We are excited to introduce these creative works of Watanabe Ai to the U.S. and cannot wait to see innovative new works coming out of this young and talented potter’s kiln in the future.